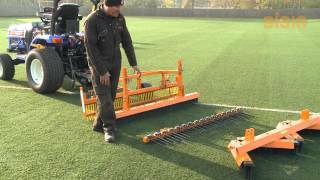 A demonstration video of the SISIS Varibrush used for artificial and synthetic turf maintenance. 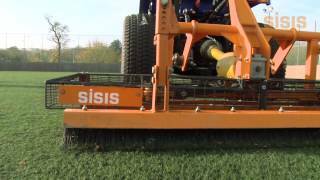 The SISIS Varibrush is a tractor mounted multiple-action brush which is effective on natural turf and synthetic turf and is suitable for a wide range of applications from sports field, artificia and synthetic turf to amenities and lawns. 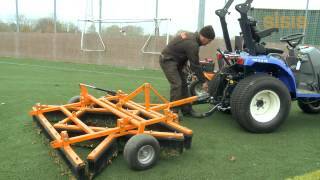 This video demonstration shows the SISIS Twinplay which is used for artificial and synthetic turf maintenance. 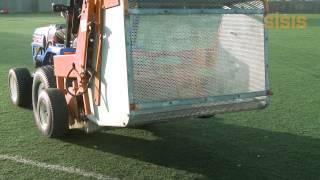 Attached to the SISIS Towed Implement Frame, the SISIS Twinplay is designed specifically for daily maintenance of artificial surfaces, keeping them in good playing condition and maximising surface life. 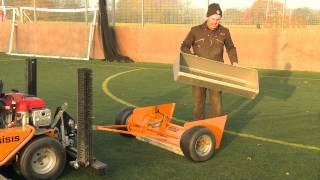 This video shows the SISIS Towed Implement Frame, designed specifically for daily maintenance of artificial surfaces, keeping them in good playing condition and maximising surface life. It is ideal for towing behind small compact garden tractors to ensure high quality care of artificial surfaces such as sports fields, golf courses and amenities. 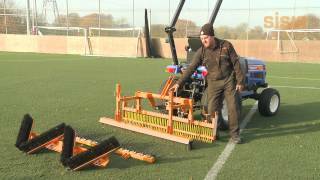 This video demonstrates the SISIS Litamina 1200 in action on synthetic turf, an application that is well suited for. The SISIS Litamina 1200 is a tractor mounted compact sweeper and collector for collecting all types of surface debris from fine turf and outfield turf. 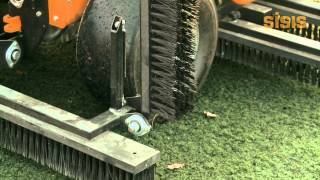 Its effective sweeping brushes mean it is ideal for synthetic turf maintenance and amenities. It is suitable for maintenance of football, and artificial pitches. It can also be used for lawns and gardens.